The Leaf was a milestone for HSL’s property development arm and Sarawak’s real estate industry. Launched in November 2009, The Leaf was one of the first true guarded and gated residential communities in Sarawak. It remains one of the best high-end gated living communities in the state. 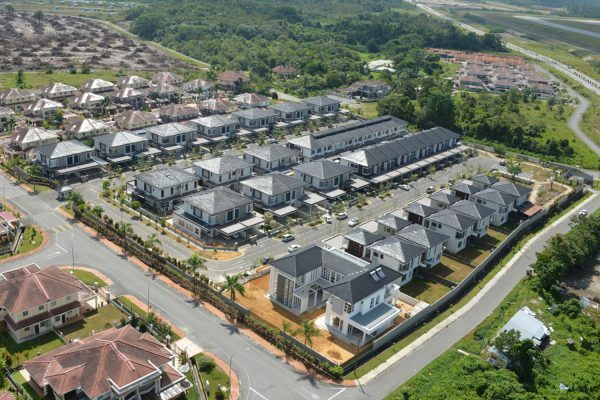 The success of The Leaf, which comprises 54 landed homes, is the precursor to HSL’s mammoth 200-acre La Promenade – the largest guarded and gated project in east Malaysia. A safe and secure living environment was prioritised above all else when HSL planned The Leaf. The community has 24-hour security with regular patrols by trained guards. The perimeter of the estate is protected by a state-of-the-art electronic fencing, while a single entry and exit point ensures that there are no unwanted guests inside the exclusive estate. The Leaf was created to have an emphasis on good-looking design, and since its launch, has been well maintained. Safety features like the guardhouse were designed, not just as a utility, but as an architectural statement using stone facades and green streetscapes. Tucked away at the end of a cul-de-sac is a recreational park with a playground, exercise zone and fruit orchard. Meticulous planning went into the designs of these spacious homes. We focused on quality, practicality and flexible layouts. Homes in The Leaf comprised link and semi-detached units as well as bungalows. All types shared some common features including wide car porches, weather resistant Murobond paint and imported tiles.